No More Query in Siebel. Just Ask! Injust the last five years, we have become more dependent on smart devices or intelligent personal assistants in our daily lives, such as with Apple's Siri or Google Home and Amazon Echo. These devices have simplified how we live by quickly providing us with answers to questions, managing tasks, planning our day, and even controlling other devices in our homes. Through simple natural language questions, we can instantly get suggestions on where to eat or how many calories there are in an egg. They helps us get simple things done, like playing music, informing us of anything scheduled for the day, controlling the thermostat at home, or keeping a shopping list. Since these devices have become the norm, finding ways to improve how quickly and accurately we receive information has become paramount. By using Natural Language Processing (NLP), getting answers either by text or dictation will become even faster and more relevant as these devices evolve. Almost every organization is using tools like NLP and Artificial Intelligence (AI) for searching databases. Siebel, which has been around for about 20 years, handles queries in an outdated fashion. When a user performs a search, the system not only uses exact words but is also case sensitive. Therefore, Siebel will only find results based exactly on what is typed. This means that the system will not produce results based on exactly what you need, but rather, on exactly what you ask for. For example, if you misspell a word or use lower case letters instead of upper case letters, what you are looking for will not appear as a result in your search. Another reason why Siebel is outdated is because it takes much longer to get results based on specific searches. This is due to the fact that users have to browse through several menu options and screens or click on different drop-down items to get specific search results. Qupplet from SoftClouds is an NLP engine integrated into the Siebel Interface as an applet and appears on the users screen. A quick Qupplet query can get accurate and relevant results and save users the amount of time it takes to perform a search. The main difference between searching with Qupplet and searching with Siebel is the ability of Qupplet to analyze what a user wants based on their natural language question or search request, as opposed to a menu-driven approach or SQL-like query. Qupplet is able to extract relevant information using natural language rather than syntactical queries to better define and narrow searches. In other words, Qupplet "understands" what you're looking for and filters, sorts and retrieves information based on plain English. Users can perform searches based on a timeline. For example, entering text in to the search bar such as, "give me John's sales for last year". You can also search using timeline terms like today, last week, or last month. Searches such as, "deals closed in March" can also be used. Similar to timeline checks, users can search by using special occasions like, "give me John's sales before Halloween." Another example is searching by location like, "accounts that belong to 123 Elm St.," or if you wanted a list of contacts created by admin you would type, "Contacts created by ADMIN." Qupplet also allows users to search from previous data with a quick response time using a single screen. To see a demo on Qupplet, visit this live Webinar Recording. To know more about Qupplet, please click here. In our labs — based on the tests we found that it takes an average of about 40 seconds to input data in Siebel. Qupplet cuts this time by more than half by simplifying the search for users by using natural language. Wherein search results were only limited to exact words, results will now be based on similar words. Using the Qupplet plugin within the Siebel application, users view a page with a search bar to enter data. A user inputs data into Qupplet using simple English and the plugin passes the question to the NLP engine which then analyzes the question and builds a query string that Siebel understands. Qupplet then passes the query to the Siebel database which returns the results to the user. This process is shown in the diagram below. North America, which held the largest of the artificial intelligence market share in 2015, has adopted different AI technologies. It is being used in industries like manufacturing, government, media and advertising, consulting, healthcare, and transportation. NLP, which understands human text and speech, belongs under the umbrella of AI and is expected to grow enormously and hold the largest market share up to 2022. Semantic technologies like Machine Learning & NLP are gaining prominence today. With NLP it is possible to build enhanced products & applications that provide the tools needed to improve and deliver better user experiences. NLP as a technology continues to handle more sophisticated and broader domains. Its ability to understand human language has been improving rapidly. The range of applications of the technology is increasing every day. NLP software-based solution vendors and service providers will continue to grow as the market expands. Tractica predicts that by 2024 the annual revenue of NLP software bought by enterprises for their own internal applications will increase to over $200 million and the total NLP hardware, software, and services will total $2.1 billion. Human-like understanding of speech and text has become an essential part of most everyone's life. From getting information and giving instructions, NLP has shaped the way we interact with technology. It has made our lives a little easier by giving us real-time information at the tip of our finger — and at the command of our voice. Not too long from now there's a high probability that NLP will be integrated into most of what we do on a daily basis. Talking to a device will eventually be just like having a conversation with a friend. The CRM Industry understands that NLP can enhance the customer experience and can also increase customer satisfaction, streamline processes and cut costs. Adoption of core technologies like NLP, AI and Machine Learning is expected to be adopted by all the CRM providers. 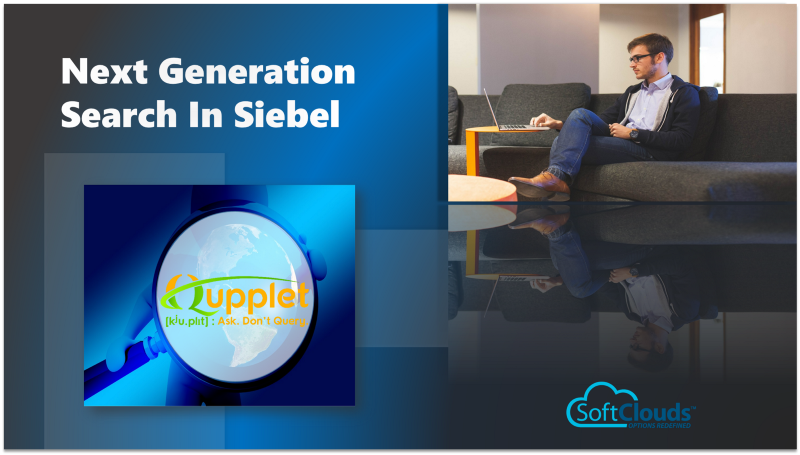 Qupplet, an innovation from SoftClouds will help Siebel CRM users get efficient, smart and effective. Click HERE or email us at "marketing-at-softclouds-dot-com"